My previous visit to Goa, in my long gone youth, was the usual touristy affair replete with feni and a prurient young Indian male’s enjoyment of the fabled beaches of Goa. This time, however, I was out on a trek and on the look out for the beauties of nature that had little to do with the female form! Vinod Hari – my usual Good Samaritan for these ventures – had managed to get a couple of friends in Goa to organize the trek for us. Damodar and Sandeep had a difficult time, apparently, in getting the tour itinerary organized thanks to the fact that the YHAI chaps, who have experience in conducting tours in the area, were extremely reluctant to share any information regarding the trek. Such reticence from a purportedly non-profit organization surprised us when we were told of it, but then I suppose there can be bad apples everywhere! Be that as it may, our intrepid duo did manage to hook up with some very decent guides and the tour was on! We set off on the trek from Mollem on a very broad jeep trail and, as usual, walking into the embrace of the forest was a balm to the soul. 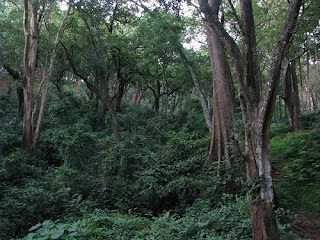 Walking on easy terrain while in the forest on a trek is not the norm – as I may have mentioned before – and, thus, we made the most of the luxury of soothing your eyes with the green vistas around you, instead of concentrating on where you were placing your foot. The jeep track being broad, there were patches of sunlight and shadow on the trail and looking up provided visions of emerald and sapphire embedded in the platinum of diffuse sunlight. Bird song, as ever, provided a backdrop though one must admit that it was desultory here compared to the symphonies one got to hear in Parambikulam. This jeep track must be familiar to anyone who has gone to the Dudhsagar falls in Goa. Of course the usual entry point is from Collem, which would have cut short the trek by about 6 KMs. We didn’t mind the extra walk…not at the start, at least! 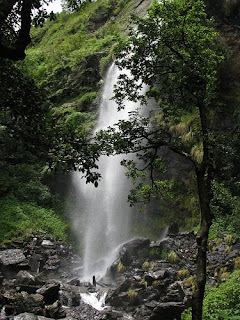 After a 15 KM trek we reached the Dudhsagar falls and started climbing up the dense forest to the top..rather than the bottom of the falls that tourists normally reach. The point we arrived at, after walking along the railway track for a few minutes, is next door to the Dudhsagar railway station. There was a beautiful pool at the bottom of the snaking white lines of the falls. Vinod was into the water in a jiffy and started climbing up the falls in his usual exhibition of a reversal of the evolutionary process. Being the timid non-swimmer that I am, I contented myself with disporting in the shallow reaches of the pool. After that invigorating bath we proceeded to climb up a relatively steep incline through the forest. Damodar, Sandeep and Sagar (Not of IIMB88!) were accompanying us, as I should have said before. The climb proved a stiffish task for Sandeep and Sagar, who had not been on long treks before. Sagar, for a fifty-year old, showed amazing courage in continuing with the trek even after cramps had threatened to incapacitate him in the course of this climb. We were headed to a village near Kuyeshi (having heard it pronounced only, my spelling may well be totally off!) which was where our guide – Krishna – lived and where a school was to be our camp for the night. The climb ended in grasslands and to our left was a hillock on which a magnificent Sambar deer looked disdainfully down on us for a few minutes and then galloped gracefully away. Golden dusk painted the light green of the grass and the cup of trees behind us framed a fairy tale setting. We reached the village by around dusk after about 12 KMs from Dudsagar. 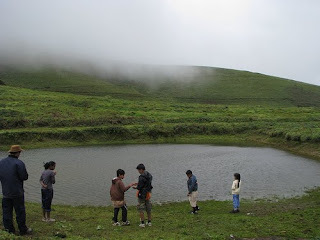 Part of the reason why it took us so long was the fact that the trekkers’ usual companion in these parts – leeches – were present and my companions were busy de-leeching themselves every now and then. Actually by the end of the trek others could proudly sport a few leech bites while the leeches showed total disdain for me and I felt moved to tears when a lone leech took pity on me and deigned to climb up my shoe! I can only postulate that the Ombattu Gudde leeches had probably marked me as their herd animal and, thus, these leeches did not want to challenge their territorial limits! Krishna had arranged for dinner at his residence. He provided the Goan equivalent of Alu-mutter and, with the bread we had along, we ate a good meal. He, probably had not bargained for the fact that we would find his house a cosier place to sleep in than the school but we ended up inflicting our company on his household for the night. Sleeping with a buffalo calf chewing on your mat at the foot of your bed was indeed a new experience to me. I have been with people from Isha before and, thus, I am blasé to being woken up by the sounds of snakes hissing and crows cawing around me! These sounds that necessarily accompany the observance of the Isha Kriya was new to the village, however, and an inquisitive neighbor dropped in to check out the menagerie that Krishna had brought home! After a couple of hours of Kriya and hatha yoga, we set off to the next destination. 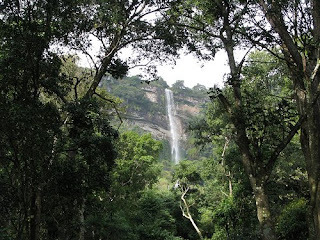 The 10 KM trek to Castle Rock was largely through flat terrain and a large portion of the trek was to be by a tar road. Needless to say this was not greatly to the liking of Vinod and me since we had enough tar roads to walk on in our respective cities. Krishna suggested that we could detour for about 6-8 KMs, if we felt like it, in order to take in the Vajra river. Water rats that we are that idea was immediately seized upon and we plunged into deep forest immediately after cutting the tar road. The Vajra river was a sight not to be missed and worth every thorn that scratched us on the way. Imagine walking out of the forest to see rapids on all sides of you pouring into various pools that join a stream in between and all of them shimmering in the sunlight. Imagine the sights of rocks carved in shapes, which no sculptor would dream of, declaring to you the mighty power of flowing water. Imagine, then, hot and sweaty bodies plunging into the pleasantly cold water and being pummeled by the flow of the rapids! Bliss! Well! Slipping down a rock on the way and banging your knee on the rocks does not count as bliss but then I have become accustomed to doing something like that on every trek! If one fall a day serves to satisfy the Gods of mischance, I will take my spills to get to un-spoilt places like these! After about an hour of splashing around in the water and then bulling our way through the jungle to minimize the time spent on tar roads we, perforce, hit the road and walked on to Castle Rock. 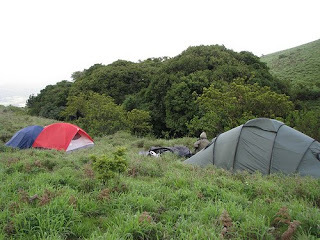 When one talks of treks in Goa it is normally Dudhsagar to Castle Rock but Castle Rock seems to have nothing to recommend it but for having been a camping spot for trekkers maybe. We, however, were not camping there and were to proceed to Anmod (Again, only heard it pronounced not spelt!). We exchanged guides here and shifted from Krishna to Govind. 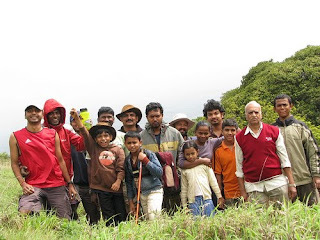 One of the interesting parts of trekking with Krishna was the fact that he knew only Konkani and, thus, Vinod and I were left in the dark groping for translations from the rest of the group. The others, apparently, felt so much at home with us that they would chatter away in Konkani and then walk on presuming that we were abreast with the conversation till we asked them for translations. Sometimes we would have asked them to ask Krishna something and they would duly do so and receive the answer and, then, feel no need to pass it on to us in English or Hindi! There is such a thing called being too much at home! Govind, however, knew Kannada as well as Hindi which made us more comfortable! The about 8 Km trek to Anmod from Castle Rock started off on a tar road but, after about 1.5 KM we were led off into the jungles again. Walking in the jungle with imminent dusk is a sublime experience and, when you are pleasantly tired, you tend to do it in an almost trance-like state. By the time we hit the outskirts of the village it was twilight and we reached Govind’s house to put up for the night. There is a bus stop at Anmod and, finding that beer was available, Sagar and I made the most of the opportunity and downed a couple before retiring for the night. The first stop the next day was a place called Tambdisurla which was about 13 KMs away. 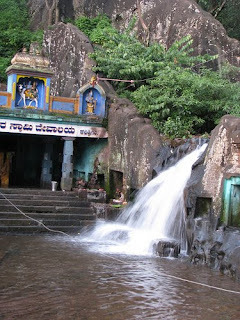 A 13th Century Shiva temple, built by the Goa-Kadamba dynasty was the highlight of the place. The route from Anmod to Tambdisurla involved steep descents and, as any trekker can tell you, descents are not much easier on you than ascents. Any descent tests your knees and ankles and when you walk on loose stones overlaid with dead branches it can be very treacherous. Top it with having to walk on a path with thorny plants to both sides of you all thoughts of the scenery around you vanish in the effort of having to keep your footing while warding thorns off you. Why people enjoy doing this is a mystery on par with why people want to climb the Mt. Everest and the only answer one can give is the classic one of “Because it is there”. We reached Tambdisurla, which is on the regular tourist route and when we were enjoying a invigorating bath in the nearby stream a huge crowd of Russian tourists landed there. A few of them ventured to the stream with a view to taking a dip but were apparently put off by the fact of having to share the stream with us. As one of us commented, maybe if they had been Yanks they would have piled in till we found ourselves ousted from our cosy spots in the river! Having ogled the temple with our sculpturally uneducated eyes we had our lunch and proceeded onwards on our way back to Mollem. 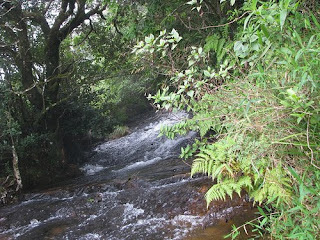 A further 4-5 KM down the line we came across another inviting stream and jumped in for another bout of water sports. The rest, as they say, is anti-climax and the worst of the anti-climax was the long 5-6 KM walk on the road to Mollem gate where Damodar had parked his car. Seldom, indeed, have I been on a trek that brought me back into civilization so often and it had its own charm. 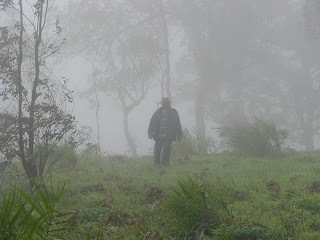 Every day of the trek we were reminded once again of how wonderful an experience it is to be one with nature in the jungle precisely because it could be contrasted with civilization repeatedly. It is difficult to thank our Goan friends adequately for having put in all the effort to make the trek possible. After about 80 KMs in the Goa/Karnataka forests I am in Chennai for a spell of wonderful carnatic music before I set off on a trek in Kodai by end-December. I have lived all my life with a misconception! I had always thought that women of my generation had not made the sort of mark they could have made because Society was not supportive. How wrong I was! How could the Air hostesses of my time have had their careers zooming up without the help of ‘Ariel Oxy-Blue’? How could they succeed in the corporate world without the priceless help of ‘Fair and Lovely’? How could a career woman balance Work and Parenting without Clinic Shampoos? What a deprived lot women of my generation were, being denied these invaluable aids to a successful career! The language of beauty aids has changed from being a necessary adjunct for women to captivate men to being necessary for their corporate success. Men, however, have now become the target for beautifying to attract women. A stupendous turning of the tables indeed! This quest for linking successful women to beauty aids can be carried too far, however. Santoor may keep the pretty choreographer mother looking young but for Madhavan to be so ignorant of his own field that he does not even recognize an award-winning choreographer seems to be carrying things a bit too far. The hairstylist, worthy of being a cover page story, who is so ignorant of other fashion aids like an Anti-marks cream must have an Arjun-like fixation on hair to the exclusion of everything else! It might have been better to have the success in a different field in order to ensure that these characters do not look like total nerds, but who knows what compels the ad-makers to stick to this sort of formula. Be that as it may, for ads to be selling to successful women or selling success to women is a welcome change. Because they are worth it! The first issue one needs to sort out when contemplating retirement, particularly when you are unlikely to get a pension, is the amount that needs to be saved by the time you retire. Lots of investment advisers have written reams on the subject. Amongst the first things that they mention is a cautionary statement about inflation. It is evident to everyone that the fact that you need Rs.6 lakhs per annum (say) today to maintain your current lifestyle does not mean that ensuring a cash inflow of Rs.6 lakhs per annum after the date of your retirement will satisfy your needs. You have to factor in the increase in monetary expenditure on account of inflation and at 6% per annum (say) your requirement may well be around Rs.11 lakhs if you retire in 10 years. This fact is abundantly underscored in all existing literature. The problem, however, is that they seem to think that the Gods of Inflation would take pity on a poor retired person and bring inflation to a screeching halt upon retirement. Most advisers seek that you plan for Rs.11 lakhs per annum rather than Rs.6 lakhs per annum but seem to conveniently ignore that fact that costs will keep increasing and in another 10 years time, post retirement, you would be trying to meet an expenditure of Rs.20 lakhs with an income of Rs.11 lakhs. A rough and ready method for calculating your monetary needs for retirement is to divide the annual funds requirement at the time of retirement by the difference between your expected rate of return and the estimated inflation rate. To illustrate, if your expenditure at the time of retirement is expected to be Rs.11 lakhs; expected return on your money is expected to be 10% and expected inflation rate is expected to be 6% divide Rs.11 lakhs by 0.04 to derive the required savings at the time of retirement. Thus Rs.2.75 crores would take care of your retirement provided your estimates of expenditure, return and inflation rate hold good. The above calculation actually ensures that you can live off your savings in perpetuity. A cautionary word, however, is required here. Post retirement, you will find that your first year’s return is Rs.27.5 lakhs while your estimated expenditure is Rs.11 lakhs. The excess amount is to be re-invested in order to ensure that future inflationary increases are taken care of. In case you feel flush with what you consider to be excess returns and blow up the money you may live to rue the fact. The model works under the assumption that your initial expenditure is as estimated and, in every subsequent year, you spend no more than your previous year’s expenditure increased by the expected inflation rate. (Well! The real world does not operate as elegantly as the world of maths. Inflation rate will keep fluctuating from time to time. As long as you stick to your expected life style you should be OK). You can readily see that you may actually require lesser money since you do not really think that you are immortal. If you want a more accurate method for computing your financial requirements adopt the following. 1. Calculate your inflation adjusted rate of return as [(1 + expected rate of return) divided by (1 + expected inflation rate)] minus 1. For our example, this would be (1.10/1.06)-1 which would be .037736. 2. In Excel, use this rate for return, the number of years you expect to live post retirement and your annual expenditure at the time of retirement in the PV function. For our example, this would be =PV(0.037736,20,1100000), which would give you a result of about Rs.1.5 crores. It is apparent that when you fund only 20 years of the future the amount required is far lesser. If, however, you happen to outlast the expected lifetime you could end up totally destitute. Please remember also that the expenditure level has to be maintained for the same lifestyle and the excess re-invested. Thus, when you plan for retirement, ensure that you underestimate your returns (also ensure that it is post-tax returns! ), overestimate your expenditure, inflation as well as longevity. You can always find a way to spend the excess cash but doing without what you consider are your needs may not be a palatable option. If, however, you estimate so conservatively that a lifetime of saving is not enough, prepare to enjoy a lifetime of working! These days the ads are addressed to a clientele with an IQ far in excess of my own. Whether I have an unnaturally low IQ or whether the standards have gone up far beyond the levels achieved by my generation is a moot question. Take for example the Pepsi ad where the young chap climbs over all sorts of junk including some clad in suits while repeatedly yelling “I can’t hear you’. When he issues his climactic yell of “I can’t hear you” with guitar in hand, I don’t know whether the audience was intended to get the message that the young prefer not to listen to the old. All I could think was that if Pepsi wanted to communicate the message that drinking Pepsi would render you deaf, this ad would do a fine job of it though it beats me as to why Pepsi should want to communicate such a message. There are enough people sending out messages about what they think are the deleterious effects of colas on various parts of the body so why should Pepsi be spending its ad budget on one more such message? The ad for Maruti Estilo(?) was truly wonderful. If only my father had known that the reason why my school friends did not find me attractive was because he did not own a Maruti car! Where he would have gone for a Maruti car in an era of Ambassadors and Premier Padminis is not the point – it is merely the principle of the thing! The idea of solving childhood angst by throwing big cars at them can only strike a stupendously creative and socially aware mind! I have no doubt that all the people concerned with the ad went home and duly complained about the ‘pester power’ of their children!! Having groused against one ad for being too complicated and another for having been too simple, you would hardly be surprised if a complaint against spreading social extravagance is followed by one against frugality! There is this Hamam ad where the mom sends her daughter out to buy soap. Since she didn’t tell her what soap to buy she gets anxious about her daughter’s entire future being spoilt because of her purchasing and using the wrong soap! I am a votary of frugality, all right, but this mom’s reluctance to throw the soap away - even though using it would, in her opinion, spoil her daughter’s entire personality and future – seemed like carrying frugality a bit too far. From what I see from ads, I live in a world of women busily working at becoming fair by way of using ‘Fair and Lovely’ in order to attract men, who are on the hunt for ‘Fair and Handsome’ so that they can attract women! Deodorants, which are supposed to de-odor you i.e. rid your body of smell, are advertised for their fragrance which will – surprise, surprise – attract women to you. The entire fashion industry is in imminent danger of being run out of business. When you can attract women merely by brushing your teeth, why do you need all those fancy and expensive expedients? I have to log out now since I have to log in to ICICI Direct to short the entire gamut of fashion houses. You can readily see that the photograph in my earlier write-up is the same as the one carried here. Some more photographs of the Bandarpoonch trek are here. I am no photographer and all the photographs have been taken by other members of the trek group. One keeps finding that one has not mentioned all that is there to convey about a trek. For example, the evening bridge sessions with Vinod, Chandru and Dr. Sunil were a part of the daily routine. The other three tried their best to play bridge despite my best efforts at disrupting the game! What with point counts, bidding conventions and calculated card play, Bridge seemed more like work than play to me but the others assure me that I can get to enjoy it. But, then, there are even people who enjoy working! I also see that I made a passing mention of the fact that the Bridge quartet shared the tent with the girls. The effect on the girls of this arrangement bears mention. 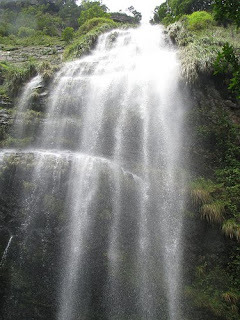 In fact, if you asked them about the trek the enjoyability quotient of this trek would probably drop drastically! What with four of the girls sharing their tents with their dads, you can readily understand why this tent emptied rapidly and the boys’ tent was filled to bursting for as long as possible! The problem for the girls was the singing sessions between us after it was too late for them to be staying away. At least we called them that but, if you had asked them, they would have called them caterwauling sessions, unless they felt extremely charitable at the moment. The problem was not merely our selection of songs but also the fact that our very presence put a stopper on their own singing (or caterwauling) sessions. We came in very handy, however, upon reaching the campsite and finding wet and dirty sleeping mats, thanks to the incessant snowfall. Of course dads don’t do all the work but they come in handy for the heavy duty lugging. Attempts at getting us to stuff in all of their sleeping bags into their respective covers came a cropper, however, after the first day. We may be foolish but we do learn from our mistakes! All in all, it was not merely Nature that provided all the fun in the trek. Human nature did add to it!